Heidegger's star has dimmed a bit, but his heavy German prose is still famous. The philosophy presented in Being and Time is expressed in grotesquely obscure language, but the gist of it is intuitive: our understanding of our own mortality brings the world into focus for us, and it is only in light of that understanding that we honestly know anything at all. St. Augustine had some thoughts along these lines, as Heidegger points out with all due deference; so have several other people. Nonetheless, in the spirit of this work, let me present an authentic, primordial reading of the book, unencumbered by the vast machinery of critical appraisal it has occasioned, or by the loose ends that stick out of my own exposition. Before philosophy, before theory, before even language, I know quite a lot about the world. What I authentically experience is "presence," or "being present," and moreover, being present in a world and a history. This book's word for that presence is "Dasein," literally "to be there" in German; a common term for "existence," it is here given a more esoteric meaning. Everything connected to Dasein is mine, but Dasein is not I. In the authentic sense, the world is not just an assembly of objects from which a list of characteristics can be deduced or detected by study. What I really experience is an environment of equipment, things that are relevant to some purpose or another, even if only in the negative sense of being judged useless. Truth is the disclosure of the world and of events in a way that is always embedded in a purpose. That is truth, the most real being. This truth is mine, and it is not eternal. My being is the context of world and history in which I find myself; what has been "thrown" to me, to use the book's term. My being, then, is not an objective substance, but my existence. Using this model, old philosophical problems are either solved or never arise. Rene Descartes' and Immanuel Kant's flawed efforts to demonstrate that there is an objective world outside the solitary self are unnecessary, because there is no inside and outside: Dasein encompasses the world in the first instance, and "I" is just another tool for which it has a purpose. Other people are primordially present just like the "I" is; there is no deeper level of experience that could bring us behind or below these things. Language is made possible by this immediacy. I understand the Others because I already know what they could be saying. This understanding of being that has just been explained is fully experienced only rarely, however. Dasein tends to fall into inauthenticity, in which it identifies with the Others and not with its own primordial experience. This is the public world, the eternal world, the world of conjecture and abstraction. It is also, for the most part, the world of the Western philosophical tradition. This tradition forgot the quest for being to some extent even as early as Plato and Aristotle; the Pre-Socratic Greeks understood primordial Being, but that history is not explored in detail in this book. This presence that makes the world, Dasein, is "care" in the sense of "anxiety." This anxiety is generated because authentic Dasein is turned toward death. This orientation toward death makes Dasein, our immediate experience authentic, because it makes me shake off the public concerns of the Others. This awareness of death is not the same as the surmise that at some point in the future I will probably not be living. The defining characteristic of this anticipation is that it precedes knowledge of the world; it is indefinite with regard to mere clock time, the time of the Others. The approach of death is how the world is, it is not a fact in the world. (Heidegger did not use this very un-Kantian expression, but it seems to follow from the book's argument.) Neither is the anticipation of death experienced as simply being morbid. Dasein speaks to the Self (which again, is not quite the "I") in the form of the conscience. What the conscience says is that we are guilty, and we are guilty because we are finite. Anticipatory resolution toward death is the ultimate authenticity. "Resolution" here means the readiness to accept this anxiety in the face of death. This resolution provides the stability that is constitutive of the authentic Self. The author understands that his analysis is circular; his model of the world requires a definition of the Self that could apply only to the sort of world he posits. He does not take this as an objection, however. Any analysis of being is going to have this character, we are assured. In any case, Dasein is the presence of the future and the past, with the future in its authentic form as the orientation toward death. Primordial temporality, then, the temporality I know before all theory, is directed toward the future, a future that is finite. But Dasein is not just temporally finite; it is also historical. Heidegger's system allows for a kind of Beatific Vision: called "the moment of vision," it is a rapture of Dasein that reveals authentically the situation of one's world and time (as distinguished, presumably, from what Others say about it, or what contextless theory would suggest). My understanding, then, is grounded in the future, but when I understand, I understand in some particular state of mind, in some mood. That is grounded in the state of having-been or done something; it is the past as an aspect of my present. Again, Dasein is temporal. It sees a world with a temporal horizon that transcends it. Space and time are united and made meaningful as aspects of the accessibility of the equipment of which the world consists. The resolution we have just discussed, which accepts the finite possibilities of my Dasein, accepts the particular inheritance that has been "thrown" to my Dasein. On the personal level, Dasein is fate; in being with others, not necessarily in an inauthentic sense, it is destiny. There can be a historical "moment of vision" as well as a personal one. The authentic appropriation of history accepts the past and "repeats" it. This does not mean simply carrying out the past again in the present, but rather taking the past as a proposal to which a rejoinder can be made. The desire for progress plays no role in this process. The authentic historical sense, then, understands the past as the recurrence of possibilities. Its understanding makes of the past an implicit critique of the public present, because it makes "today" no longer the authentic present. The inauthentic sense, in contrast, understands the past in terms of the present. That makes the past a burden. Dasein exists as an entity for which, in its Being, that Being is itself an issue. Essentially ahead of itself, it has projected itself upon its potentiality-for-Being before going on to any mere consideration of itself. In its projection it reveals itself as something which has been thrown. It has been thrownly abandoned to the 'world', and falls into it concernfully. This works better in German, but not much. The book repeats Count Yorck's defense of obscurity in philosophical prose; easily comprehensible language, it seems, is easily comprehensible only because it communicates the public and the superficial. Readers may be reminded of "The Tale of the Emperor's New Clothes." Martin Heidegger lived from 1889 to 1976. He taught at the University of Freiburg and at the University of Marburg. As a young man, he was a member of the Society of Jesus, though he was never ordained. The fact that he wrote his doctoral dissertation on Duns Scotus might not be irrelevant to his idea of good philosophical writing. He left the Jesuits, and served for health reasons in a noncombatant post during the First World War. He was a member of the Nazi Party in the 1930s, with varying but subsequently embarrassing levels of enthusiasm. After the war he was rehabilitated and continued teaching. All I would like to do now is raise a few underemphasized ways in which Heidegger's system fits into intellectual history. The philosophical species here is called "existentialism," which belongs to the genus "phenomenology." That latter approach to understanding appeals to the actual phenomena of experience. It is, perhaps, the polar opposite of scientific reductionism. It was hardly new, even when Heidegger was writing; Hegel was a phenomenologist of sorts. Nonetheless, self-described phenomenology was one of the growing points of European philosophy in the first half of the 20th century. To some extent, it simply reflected a general characteristic of the period. What Heidegger was doing was not so different from what the natural-language philosophers were doing at the same time, or for that matter what some of the pragmatists were doing. As we noted at the beginning of this review, philosophies that structure the world in terms of an eschaton are not new, either. The structure has some force, irrespective of the merits of the argument for it. While reading this book, I was reminded of the device of "tonic drive" in music. The sense of time in music can be made meaningful by rhythm, in which the ear learns to expect the next beat. The classical way in Western music to create a sense of time, however, is to end each cadence with the tonic of the key. The expectation of that end turns noise into music, like the anticipation of death creates the world. 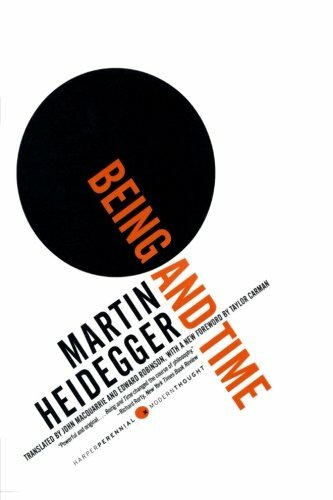 Heidegger's philosophy is related to the science contemporary with it. Heidegger's view of the dynamic Self is not so different from Freud's view of the matter, and in some ways it is even more reminiscent of Jung's. These two are not cited, however, though we do get some citation to early, pre-Freudian personality theory. Even more interesting is the way that Heidegger's model of truth as Dasein's disclosure of entities chimes with the contemporaneous development of quantum mechanics, which holds that reality becomes certain one when observation collapses the wave function. Werner Heisenberg was Heidegger's friend at some point, but it is not clear who might have been influencing whom. More obscure, but perhaps more provocative, parallels can be found in the similarities between elements of Heidegger's system and that of esoteric Tradition, principally though not exclusively as represented in the philosophy of Heidegger's contemporary, Rene Guenon. Both were convinced that Plato roughly marks the point where Western philosophy departed from the contemplation of Being in order to gossip about the eternally expanding vacuum of mere ideas. Both had a horror of mechanism and quantification, and of what the modern world's embrace of these principles meant for the future. (Guenon's apocalyptic masterwork, remember, is called The Reign of Quantity and the Signs of the Times.) Parallels show up even in the details of their work, such as their insistence that time and space are meaningful in a way that geometry and clock-time simply caricature. Both were oddly fond of the adjective "primordial," at least if their translators are to be believed. These points I have mentioned concern matters that were in the philosophical air of the Western world in the 1920s and later. To the extent there was direct influence, it was likely to have flowed from the better known writer to the more obscure. In any case, we see again that thinkers reflect their period, however eccentrically.